For outsiders, the traditional training apparel of Pahuyuth may seem like an anachronism. 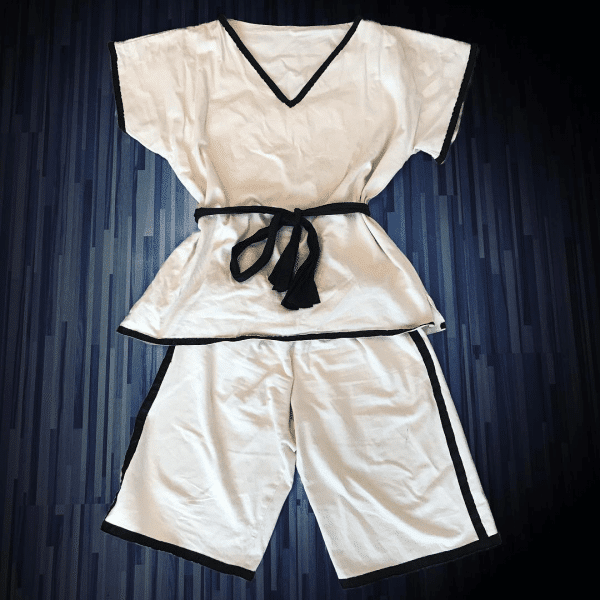 It does not correspond to the current trends in martial arts functional clothing, nor does it look in any way like Thai boxing shorts, karate suits or judo uniforms. Basically it wouldn’t bother any Pahuyuth practitioner to ever train in other training gear or in streetwear, especially since most real applications don’t take place in a traditional outfit. The traditional training gear, however, fulfils a number of useful functions for Pahuyuth training, which is why we still stick to this design to this day. The Pahuyuth training clothing consists of a top, trousers and a belt. The three-quarter-long trousers have always been the clothing of the common citizens and free warriors of Siam, while the far-cut top design is based on the shirts of the Thai combat troops of the Nanjauw era. The tying of a hip cloth or sash has always been part of the Southeast Asian clothing culture and has a traditionally representative character. The origin and meaning of the belt colours is explained here. The Pahuyuth training clothes are not only used for customs – their timeless design offers various practical functions. The belts of Pahuyuth from yellow to blue. Learn more. The Pahuyuth training clothes are mostly made of natural, strong linen fabric. This is sweat absorbing, durable and in case of doubt even relatively easy to mend. Pahuyuth is the martial art of the common people. Therefore, usually no fancy fabrics such as satin or silk are used for the training clothes. These would not survive a sweaty training or a constant rolling around on the floor very well. The cream-white colour of the fabric helps to recognise possible injuries and blood losses more quickly during training. In the heat of battle, small scratches, abrasions or cuts can always occur. To be able to see and treat these immediately serves the hygiene and health of the participants. From a cultural-historical point of view, Pahuyuth training clothes also symbolize death or shrouds. The color white is often considered the color of death and ghosts in Asia. The simplicity and the idea of equality lead to the fact that the Pahuyuth training clothes are unisex. The uniform, wide cut and the coarse fabric conceal body shapes and problem zones equally. This ensures a harmonious training atmosphere and a more concentrated learning. The Pahuyuth training clothes usually have no individual embroideries, badges or decorations. These suits are for training and not for representation. The average temperature in Berlin (Germany) is 23.5°C in summer and -2.3°C in winter, which is much cooler than in Southeast Asia. For this reason, wearing a simple T-shirt or a long-sleeve beneath the training clothes has become common. On particularly cold days, some students also wear pullovers, hoodies and functional underwear. Training is usually done barefoot. If the ground temperature drops below a bearable level, socks with rubber studs are used. These keep warm and prevent unintentional slipping on the mostly smooth floor. In the last forty years there have been tests and attempts to optimize the design with special fabrics and other features. For example, for a time there were special summer and winter editions that were very popular amongst students. However, the basic design was never changed. The right-angled V-neck serves as a focal point during partner training and trains peripheral vision. In practice, the blurred view towards the sternum helps to adopt a non-aggressive posture (no direct eye contact) while still keeping an eye on the entire body of the opponent. 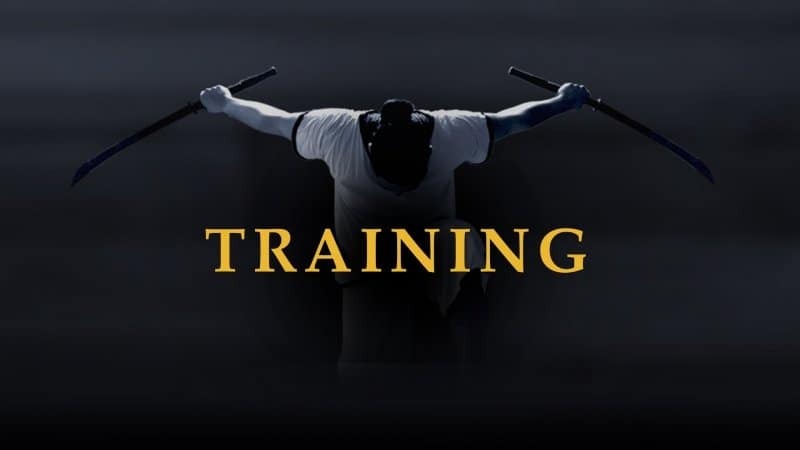 The black hems on the shoulders and sleeves help to better recognize the shoulder rotations and arm movements of the opponent during training. Especially for beginners this is a valuable help. The seams of the shirt always run sideways on the body. A seam that runs along the spine was deliberately omitted, because this would be uncomfortable when training falling and rolling techniques, if not even pose a safety risk. The trousers are usually made of the same material as the top. It reaches just above the knee and offers enough freedom of movement for high kicks and all kinds of fall and roll techniques. The trousers do not have pockets to prevent accidentally carrying around hard, sharp or pointed objects that can pose a major safety risk during training. Occasionally you may see a black fabric band on the side of the trousers. This is the so-called “warriors stripe” which identifies the wearer as a fighter who has publicly proven his abilities, regardless of his graduation. The stripes symbolize the ropes with which the deceased were wrapped in shrouds. The wearers of such a strip are figuratively warriors who have died in battle and who resist death by the power of their fighting knowledge. Warrior stripes are given to intermediate students (white belt) or basic level students (green belt) who have taken part in a public demonstration or competition. In Pahuyuth there are seven different belts and a special graduation. Each of these belts has its own meaning. The belt is worn by both men and women around the waist and tied with a special knot. More information about the graduations and belt steps of Pahuyuth can be found in a separate blog article.